Our range of products include automatic sand multi media filters, multi media sand filters, frp activated carbon filters, mild steel activated carbon filters, activated carbon filters frp and mild steel automatic activated carbon filters. 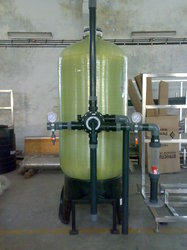 We are the manufacturers of Automatic Sand Multi Media Filters. 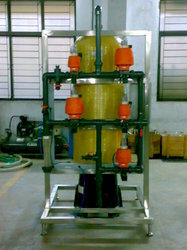 Nishu Enterprise offers Automatic Sand Multi Media Filters option. These filters are manufactured using FRP vessels for longer life and Rust free/sturdy operation. System is operated at varied velocity from 15 m/hr to 40 m/hr to produce flow rate of 500 LPH to 100 M3/hr to obtain required water quality and can be used for various applications. Filters are available with auto multiport valves (either top or side mounted) or auto pneumatic actuated valve. We use the sand (grey sand or white sand) of size 6/14 and 16/32 BS mesh mixed to provide better filtrate quality. Filter water outlet will have turbidity less than 2 NTU with inlet Suspended Solids load of 25ppm. For higher turbidity, coagulation may be required which can be offered using our dosing systems. System requires only Water and Drain supply and can be installed in a day. Well Packed - Filter media to provide good Filtered Water Quality. 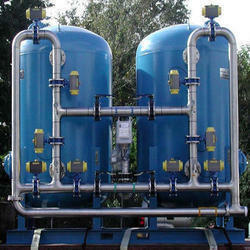 We are the manufacturers of Multi Media Sand Filters. 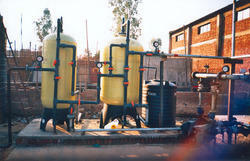 NISHU ENTERPRISE offers Multi Media Sand Filters in FRP option. These filters are manufactured using FRP vessels for longer life and Rust free/sturdy operation. System is operated at varied velocity from 15 m/hr to 40 m/hr to obtain required water quality for varied flow rate up to 100 M3/hr and can be used for various applications. FRP filters are available with the options of individual ball/ butterfly valve or multiport valve as required by customers and based on application. We use sand (grey sand or white sand) of size 6/14 and 16/32 BS mesh mixed to provide better filtrate quality. Filter water outlet will have turbidity less than 2 NTU with inlet Suspended Solids load of 25ppm. For higher turbidity, coagulation may be required which can be offered using our dosing systems.These filters are available with PVC piping and can be also offered with SS piping option. We are the manufacturers of FRP Activated Carbon Filters . 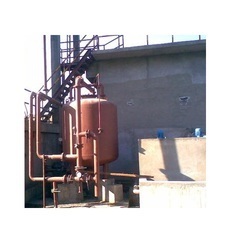 Nishu Enterprise offers Activated Carbon Filters AUTO FRP. These filters are manufactured using frp vessels for longer life and rust free/sturdy operation. 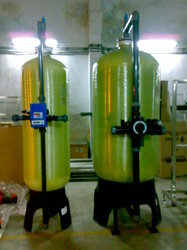 System is operated at varied velocity from 15 m3/hr to 40 m3/hr to obtain required water quality and can be used for various applications.Filters are available with auto multiport valves (either top or side mounted) or auto pneumatic actuated valve.We use activated carbon of various brands depending upon application. 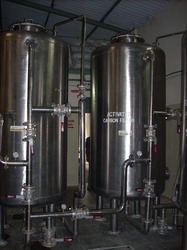 We use Norits or Calgon or Aguapuro brand activated carbon for filters. Treated water quality is free from organic impurities, residual chlorine, coluor and odour etc. Well packed filter media to provide good filtered water quality. Nishu Enterprise offers Mild Steel Activated Carbon Filters option. These filters are manufactured using mild steel vessels for longer life. 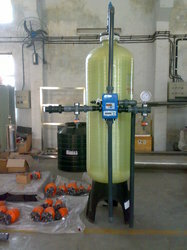 System is operated at varied velocity from 5 m/hr to 40 m/hr to obtain required water quality and can be used for various applications.Mild steel filters are available with the options of individual ball/ butterfly valve or multiport valve as required by customers and based on application.We use the activated carbon of various brands depending upon application. We use norits or calgon or aguapuro brand activated carbon for filters. Treated water quality is free from organic impurities, residual chlorine, color and odour etc. 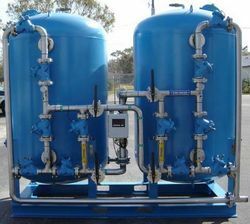 Well packed – carbon media to provide good filtered water quality. Systems are available for any capacity from 500 Lts per hour to 200 M3/hr or more. We are the manufacturers of Activated Carbon Filters FRP. 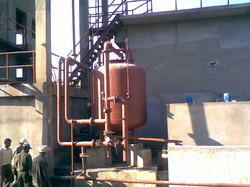 Nishu Enterpriise offers Activated Carbon Filters FRP option. These filters are manufactured using FRP vessels for longer life and Rust free/sturdy operation. System is operated at varied velocity from 9 m/hr to 25 m/hr to obtain required water quality and can be used for various applications. FRP filters are available with the options of individual ball/ butterfly valve or multiport valve as required by customers and based on application. We use the activated carbon of various brands depending upon application. We use Norits or Calgon or Aguapuro brand activated carbon for filters. Treated Water quality is free from organic impurities, residual Chlorine, color and odour etc. We are the manufacturers and exporters of Mild Steel Automatic Activated Carbon Filters. NISHU ENTERPRISE offers Mild Steel Activated Carbon Filters option. These filters are manufactured using mild steel vessels for longer life. System is operated at varied velocity from 5 m/hr to 40 m/hr to obtain required water quality and can be used for various applications.Mild steel filters are available with the options of individual ball/ butterfly valve or multiport valve as required by customers and based on application.We use the activated carbon of various brands depending upon application. We use norits or calgon or aguapuro brand activated carbon for filters. Treated water quality is free from organic impurities, residual chlorine, color and odour etc. 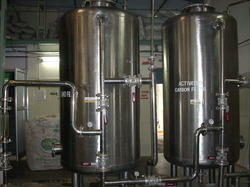 We are the manufacturers of Stainless Steel Activated Carbon Filters. Nishu Enterprise offers Stainless Steel Multi Media Filters option. These filters are manufactured using Stainless Steel vessels for longer life. System is operated at varied velocity from 10 m/hr to 30 m/hr to obtain required water quality and can be used for various applications. Stainless Steel filters are available with the options of individual ball/ butterfly valve or multiport valve as required by customers and based on application. We use the sand (grey sand or white sand) of size 6/14 and 16/32 BS mesh mixed to provide better filtrate quality. Filter water outlet will have turbidity less than 2 NTU with inlet Suspended Solids load of 25ppm. For higher turbidity, coagulation may be required which can be offered using our dosing systems. We are the manufacturers of Multi Media Filters AUTO Mild Steel. Nishu Enterprise offers Multi Media Filters AUTO Mild Steel option. These filters are manufactured using Mild Steel vessels for longer life. System is operated at varied velocity from 15 m/hr to 40 m/hr to obtain required water quality and can be used for various applications. These filters are available with auto multiport valves (either top or side mounted) or auto pneumatic actuated valve. We use the sand (grey sand or white sand) of size 6/14 and 16/32 BS mesh mixed to provide better filtrate quality. Filter water outlet will have turbidity less than 2 NTU with inlet Suspended Solids load of 25ppm. For higher turbidity, coagulation may be required which can be offered using our dosing systems. System requires only Water, Drain supply and can be installed in a day. We are the manufacturers of Stainless Steel Multi Media Filters. Nishu Enterprise offers Stainless Steel Multi Media Filters option. These filters are manufactured using Stainless Steel vessels for longer life. System is operated at varied velocity from 10 m/hr to 30 m/hr to obtain required water quality and can be used for various applications. Stainless Steel filters are available with the options of individual ball/ butterfly valve or multiport valve as required by customers and based on application. We use the sand (grey sand or white sand) of size 6/14 and 16/32 BS mesh mixed to provide better filtrate quality. Filter water outlet will have turbidity less than 2 NTU with inlet Suspended Solids load of 25ppm. For higher turbidity, coagulation may be required which can be offered using our dosing systems. Bromide Removal Filter- NISHU ENTERPRISE offers Bromide removal Filters for various capacity ranging from 10 M3/hr upto 250 M3/hr. Water containing Bromide when ozonated, produces Bromate which is carcinogenic. The level of bromate is allowed upto 20 ppb in Drinking Water. However, AGUAPURO offers systems to reduce Bromide from water to avoid Bromate transformation post Ozonation. The removal is possible up to 5 ppb level. We are the manufactuersr of Multi Media Filters. Nishu Enterprise offers Multi Media Filters in Stainless Steel option. These filters are manufactured using Stainless Steel vessels for longer life. System is operated at varied velocity from 15 m/hr to 40 m/hr to obtain required water quality and can be used for various applications. 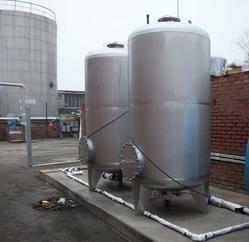 These systems are available for various capacities from 500 LPH to 300 M3/hr and more. These filters are available with auto multiport valves (either top or side mounted) or auto pneumatic actuated valve. We use the sand (grey sand or white sand) of size 6/14 and 16/32 BS mesh mixed to provide better filtrate quality. Filter water outlet will have turbidity less than 2 NTU with inlet Suspended Solids load of 25ppm. For higher turbidity, coagulation may be required which can be offered using our dosing systems. We are the manufacturers of Automatic Multi Media Filters.